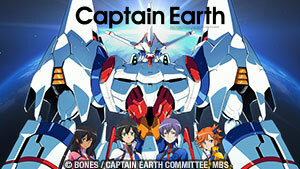 While colonizing planets in the Andromeda Galaxy, mankind discovers the remains of the mecha Ideon. When a humanoid alien race attacks, Cosmo Yuki climbs aboard the Ideon which suddenly activates! Will Yuki be able to save the universe? Planet Solo comes under attack by a mysterious humanoid alien race. The only way for the humans to stave off the attack for the Ideon to somehow activate. Will it save them? The conflict between the two human civilizations escalates. As New Lopia is attacked, the scientists fight to discover why the Ideon has suddenly begun to function. Having been mistaken for colonists, Karala and Mayaya end up on the derelict alien vessel, along with Cosmo, Kasha, Sheryl and a large number of refugees from New Lopia. As the Solo ship rushes to aid New Lopia's survivors, Karala and Mayaya plan an escape. Meanwhile, Cosmo and Kasha are joined by a new pilot for the third Ideon vessel. With the Ideon damaged, the Solo Ship returns to the planet to make repairs. As Gije attempts yet another rescue, Karala reveals the significance of Ide to her people. Karala attempts to call a cease fire, but things quickly go horrifically wrong due to incompatible technologies and a major unforeseen cultural difference. 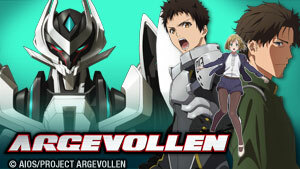 Negotiations to hand Karala back to the Buff Clan break down and the Ideon must fight the Clan’s more experienced Zan pilots in the treacherous dimension known as Null Space. When the Solo Ship lands to make repairs on a planet populated by dinosaur-like creatures, Deck and Ashura sneak out to explore, while Gije challenges Cosmo to a duel. As the Buff Clan leaders grow increasingly at odds with each other, the Solo Ship’s repairs are delayed by dinosaur-like creatures, setting up another battle in Null Space. Unaware that they are now being tracked by the Buff Clan, the Solo Ship’s crew lands on a crystalline planet inhabited by a silicon-based life forms called the Bajin. Now under the command of Karala's older sister, Harulu, the Buff Clan forces pursue the Solo Ship to a desolate planet filled with ruined buildings. Karala plans to meet with Harulu and ask her sister to stop attacking the colonists on the Solo ship... but the Buff Clan has already slipped a saboteur onboard. 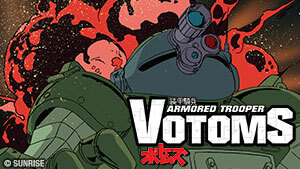 As the Solo Ship attempts to escape through a dangerous asteroid field, someone attempts to assassinate Karala and Cosmo tries a new combat tactic in the Ideon. The Solo ship finally makes contact with another Earth colony, but the Ideo-Delta is badly damaged in battle and Cosmo must recuperate on the planet Brazillier. Sheryl disobeys Bes’ orders and kidnaps Karala, but both are captured in a Buff Clan trap. 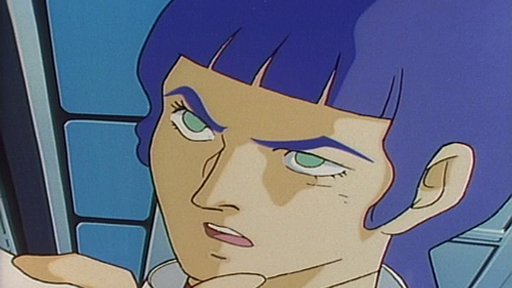 Cosmo and the other Ideon pilots must resolve a hostage situation. 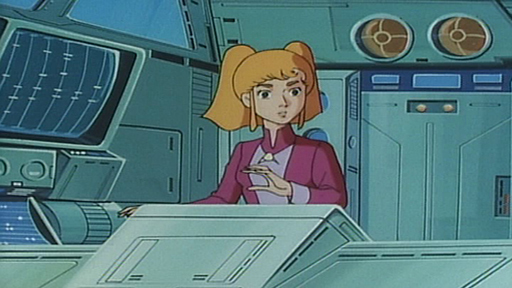 While Deck becomes Cosmo’s co-pilot on the Ideon Delta, Sheryl begins to suspect that the Ideon’s performance in combat is enhanced by the pilot’s emotions. With Cosmo and Kasha imprisoned, and the Solo Ship under attack yet again, the alternate pilots prove to be unable to make the Ideon run at full strength. The Solo Ship is allowed to land on the Earth colony world of Arjian, but when the Buff Clan forces appear, a three way battle ensues that decimates the planet. While the Solo ship stops on the all water world Flag Star to gather supplies, Karala attempts to negotiate with a new Buff Clan commander, Gyamus. Gyamus sends twin pilots in the powerful new Rogg Mack fighters to kill Karala. Cosmo learns that both Buff and Earth have been under attack by mysterious meteors. The Solo Ship and the increasingly powerful Ideon engage in a furious battle in Null Space with Harulu’s Buff Clan ship and a mysterious new force. In a flashback episode, Karala tells Mayaya about the legend of the Ide from the Buff Clan's perspective. 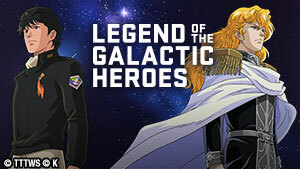 The Solo Ship answers a distress call from an Earth colony under attack by “aliens,” Cosmo rescues a girl named Kitty and the mysterious Daram Zuba attacks the Ideon. 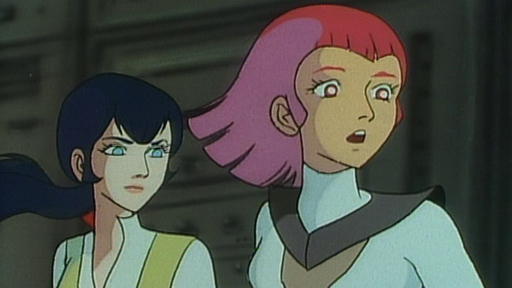 While Cosmo and Kitty try to get the Kyaral military to supply the Earth colonists on the Solo Ship, Gije and Daram attempt to steal the Ideon. As the Solo Ship and the Carale forces gear up for a counterattack on the Buff Clan fleet, Karala contemplates revealing the location of her home planet. 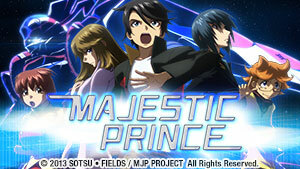 In order to prevent the pursuing Buff Clan from earning Earth’s location, the Solo Ship team attempts to destroy Daram’s forces completely… but Cosmo is still injured. The Solo Ship finally arrives at Earth but are shocked by the reception that they receive. While Sheryl travels to Moonland Base, the Buff Clan attacks again. The Buff Clan attack again, the Earth Forces order the Solo Ship survivors to surrender both the Ideon and their ship to Earth, and Cosmo gets a REALLY big gun. While the technicians try to unravel the secrets of the new Ideon Gun, the Moonland Base forces become increasingly hostile to the Solo Ship and Gije encounters Sheryl. As the Buf Clan attacks the Earth, the Solo Ship crew joins the battle, only to discover that their new Ideon weapons are too powerful to safely use on a planet. While Gije is held prisoner on the Solo Ship, Bes and Cosmo are detained at an Earth base near Bes’ home town, leaving the colonists open to a Buf Clan attack. Having removing the tracking devices, the Solo Ship’s crew plans to escape and hide from both opposing forces, while Rukuku’s new lieutenant plots against her. 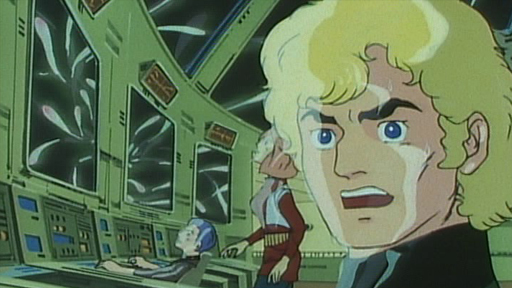 With Bes ill and Moera dead, the colonists need a new 3rd pilot for the Ideon, but when the Solo Ship is attacked again, the only qualified candidate is… Gije! While the Solo Ship tries to hide on a ocean world filled with strange giant creatures, an ill and fevered Bes has a metaphysical encounter with the spirit of Ide. The Solo Ship colonists attempt to hide on an asteroid shrouded world, but must fight when the Buff Clan and the Terran Union join forces to attack them. The colonists attempt to scuttle both the Solo Ship and the Ideon, but their plan to destroy them is sabotaged by the Earth fleet and the Buff Clan’s attack. The Solo Ship’s civilians are taken hostage when the colonists attempt to make repairs on the planet Ajian. Still on the run, the colonists realize that the increasing power of the Ideon is a double-edged sword: the more powerful it becomes, the easier it is to track. The Ide unexpectedly transports Karala onto a Buff Clan ship.